Greene Devils Have Finally FINISHED!! > News > Greene Devils Have Finally FINISHED!! It was cold and raining as we stood on Main Street in downtown Greeneville, to send off the Greeneville Greene Devils as they were bound for Cookeville, Tennessee for the TSSAA state championship game...a game they made it to for the first time in school history just last year. But something was different this year...you could almost sense it in the air as the team drove by in their bus. This team was prepared like never before; they were focused like never before; they were disciplined like never before; and they were determined like never before, to win a state championship. As the Greene Devils ran out onto the field for the first time before the big game, you could instantly tell that they were not going to lose this game. The Devils jumped out to an early 7-0 lead just 3 ½ minutes into the game...5 minutes later the score became 14-0. The Devils never let up and never looked back. At the half, the Devils had a 35-6 lead over the Trezevant High School Bears. This was a game that got out of hand on so many levels, but while the Bears got out of hand with one personal foul after another, taunting, and near fights with players from Greeneville High, the Greene Devils stayed focused and unmoved by the Bears unsportsmanlike conduct. Not once did I see a Greeneville player react in a way the Bears were hoping for…I mean after all, the Devils were not there to taunt the opposing team with their mouths or their body language, and they were not there for a fist fight. Coach Caine Ballard had his team focused on one thing, and if there was any taunting to be displayed, or trash to be spoken, it was delivered through the beat down they put on the Bears. The Bears ended the game with 16 penalties for 129 yards. The Devils continued to dominate this game in the second half on both sides of the field, and in the end, the Greene Devils of Greeneville High School won their first ever TSSAA football state championship. Final score…Bears 12. Greene Devils 60. The Greene Devils also set a single season record for the most points ever scored by a Tennessee high school. All they needed in this game was 46 points, and they scored 60 to end their season with 748 points. The previous record was set at 733. QB Willie Carmichael aka “Mr. Football” ended the game with 47 yards passing and two touchdowns; he also went for 80 yards rushing with one touchdown on 13 carries. Perhaps even more impressive and the reason behind ol’ Willie becoming Mr. Football, is the fact that he caught three interceptions in this game while on defense, and earned himself the defensive Most Valuable Player of the game. In case you’re wondering why Carmichael only threw for 47 yards (that’s not a whole lot of passing yards for anyone, especially Mr. Football), here’s why…BJ SPRADLIN!! Spradlin carried the ball 31 times and rushed for an insane 235 yards and three touchdowns to earn himself the offensive Most Valuable Player of the game. Congratulations to Greeneville High School for finishing and finishing big! They got the job done and did so with class. 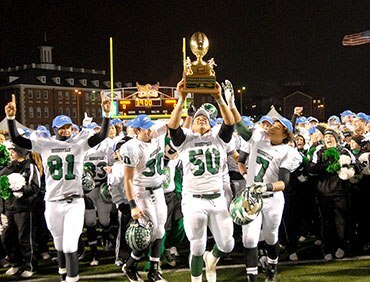 It’s something that will never be forgotten by this team and the whole town Greeneville. I know I’ll never forget it and will always consider myself privileged to have been there to witness it. Click HERE for our tribute video to the Devils.